About a week ago Anna’s cat Inari was acting a bit odd and lethargic so we brought her into the ER. The diagnosis after several days of x-rays, ultrasounds and blood tests ended up being pancreatitis (I learned that when -itis is added that means the organ is inflamed). Things weren’t looking too good the first couple times we visited her in the ER because she was on pain meds and was very out of it. Also we had a couple doctors whose bedside manner had us expecting the worst and feeling lousy in general. Seeing as Inari is nearly 18 years old (that’s like 88 in cat years!) and has been diabetic for 7 years we were hoping for the best but preparing for the worst. But a few days into her stay at the ER she was feeling more energetic and purring for us when we visited. 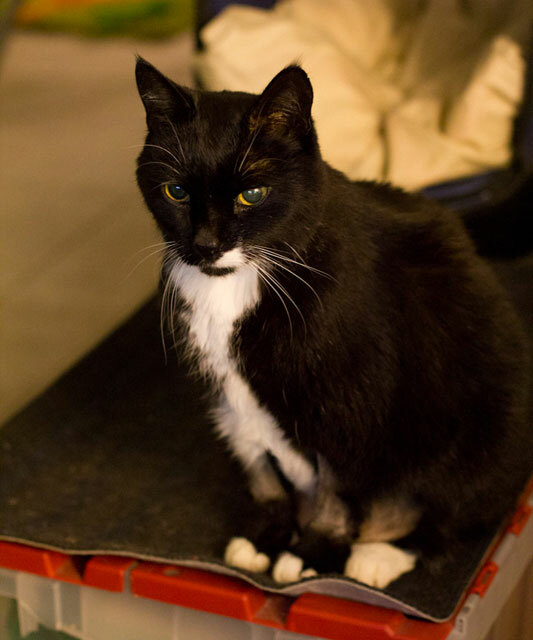 Gradually she seemed to be improving and a new doctor with a lot of expertise in cats with pancreatitis made the right decisions and we were all feeling a LOT better. Then yesterday we got the good news that she was ready to come home albeit with A TON of medication and instructions for the next several days (weeks?). We were absolutely overjoyed! The worst seems to be over but there’s still a lot of work to be done with giving her pills and stuff on a regular schedule. If you had asked me five years ago if I was a cat person I would’ve said I was “okay with cats” but now I am definitively a cat person thanks in no small part to Inari. It took a little while but she warmed up to me and even if she doesn’t sit on my lap I absolutely love her and after the rollercoaster of last week I feel so much better that she’s finally back. Oh I’m glad she’s okay. Once in a while my little boy cat gets a urinary blockage from bladder crystals, and every time I’m in tears since the vet always wants us to spend more money and makes it sound like he’s going to die (which is overblown). A cat’s health can be very stressful… I wish they could speak and say where the pain is. Glad she’s back to her old self.